We start off east of the bridge entering the city, and observe from a half-mile away that there’s a knight and three yeoman interrogating those who wish to cross. 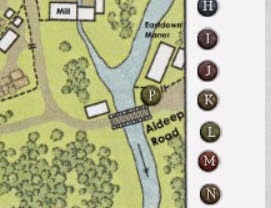 Based on our familiarity with this area, we know there’s a manor nearby – actually, lots of them. This is thanks to a poor set of Perception rolls by everyone but one character – we decided that +Tim Shorts and my characters were looking at squirrels. And thus the first title of the post was decided in the first five minutes of the transcript. Go team. We decide that a Paladin on quest isn’t one to be interfered with, and the rest of the PCs are “with the Paladin.” And the reptile man will threaten to eat anyone who says different. “I am Mark Bludiell, a Paladin of Veritas on Quest,” I say, rolling a 23 Persuasion check. “Um, uh. He looks kinda elvish. Is he elvish? Who’s Veritas? Um, yeah, there’s rebellion and stuff, and we’re checking it out . . . um, please proceed!” they say, to our retreating backs. They refer us to the Jug Inn, and let us know that business is good. As we pass through the town, we see a temple of Set, and a temple of Mitra, with a pair of Overlord’s guards outside. We approach, claiming business inside. I tell him I’m a Paladin of Veritas again; I make another good Persuasion roll, and they tell us that we can check with the Steward at Caer Tain. We decide to go get a room at the Jug Inn; on our way there we pass an apothecary, a merchant’s hall, and the millwrights . . . a chandlery for supplies, etc. I ask Rob if he’s making all this up as we go, building by building. No, he says. That’s the advantage of using Harn fan-made stuff. Lots of detail. As we continue, we see a merchant’s shop, and we recognize the name Herone. Unsurprisingly, across the street from the Jug Inn is a brothel. The innkeeper asks if we have our Tokens. We were supposed to check in with the Sheriff. She can’t let us in, but we could stable our horses while we check in. Mark pays the two days minimum to stable our horses and gear; he has no use for money anyway. While it is against my better nature as an RPGer, we decide that this group is of the “Hey, diddle, diddle, straight up the middle” strategy. We head off to the Sheriff’s office at the main castle, Caer Tain. We get to the gate, walk through without being stopped. There’s a bunch of adventurers in line, and we debate whether to wait in line or play Paladin on Quest. All the guards ready their weapons, the guy manning the table stands up as if he’s been shocked, and stuff is about to get real. They tell us that we have to check in, and if we do anything, check in with them. Food is brought, we eat, and then we’re escorted to the Sheriff. We have a very animated, hostile confrontation with the Sheriff. I score a few points, but eventually he invokes his right as minister of the law to kick us out of the city. That’s within his right, so we start to depart. I start to try and pry out the source of his trouble so we can find an amicable solution, but he’s having none of it. So Keyar Nailo shoots him. Twice. For 21 points of damage. He’s still up. Leshar, who has been planning this bit of inspired violence with Keyar for a bit, slashes at, and kills, one of the guards. Oh, it’s on now. There are only two guards inside the room. So that shouldn’t be too bad, but when we try and leave, we might find it a tetch more difficult. Since we surprised the GM too, everyone rolls initiative. Mark tries to Command the Sheriff to “Yield!” But he rolls a 23, and does not. He then attacks me three times, hitting me once for 12 HP. I guess I can defend myself now. Keyar uses Colossus Slayer and hits twice, adding but 2 HP using the ability, for 20 HP more. Vognur also attacks the largest threat, trying to clear the table (Athletics check at DC 10, rolls 7), but attacks at -2, hitting for 14 slashing, and then second attack for 11 HP. That’s 25 more. He’s now taken over 60 HP of damage, and he’s still up. Yeesh. Leshar takes another shot at a guard, and hits for 14 HP, and he goes down. Leshar jumps up on the table (rolls 26!) and gets in the faces of the two noble dandy-boys and smiles like a Kzin. Mark hits, on his first attack, for 19 HP, invoking Divine Smite to do so. This guy is still up. And he hits me three times, hitting me for a total of 51 HP of damage. Yowch. I’m at -25 HP. Keyar does slight damage (6 HP), and Vognur does 9 HP more. He’s still up. Mark fails his first death check. He gets a lingering injury, a minor scar that won’t be removed without major magic. Guess Veritas was displeased. He steps over to Keyar and smacks him twice for 35 HP. We have to deal with this guy. Keyar adds Hunter’s Mark to his roll, hits for 12 piercing damage, and our 111 HP foe finally goes down (he was 15th level!). Tain is now under new management. Vognur does Second Wind to pick up a lame 6 HP, bringing him back up to 20 HP. He then tries to stabilize Mark Bludiell with a Medicine check, rolling a 10, which stabilizes him. Whew. One of the nobles tries to flee, the other hits Leshar for 7 HP. Leshar sneers, misses, and we hear “The Sheriff is down! The Sheriff is down!” from below. Sigh. The second noble breaks and runs, provoking an attack of opportunity which hits for 13 HP. He’s badly wounded, but escapes down the circular staircase; Keyar gives chase. The Sheriff also fails his first death check, picking up a minor scar on the roll. Mark and Sheriff match now. 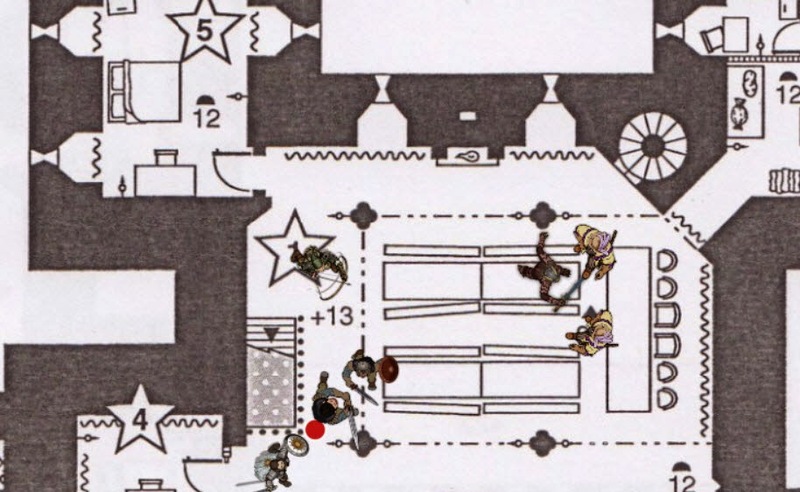 Keyar runs down the stairs closest to him, and takes out a guard down there. Vognur takes a moment to kill the Sheriff, and takes his sword – which turns out to be a +2 sword, a very nice find in D&D5. 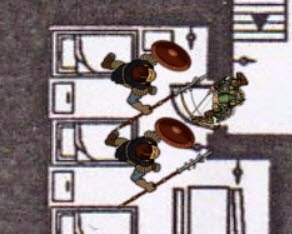 Leshar makes a Perception check, and hears the guys below complaining loudly about being trapped in a room filled with nothing but arrow slits. “I can help you fit through the arrow slits!” snarls Leshar – which would have been much cooler had he not blown his roll. But he still gets an Intimidation check; they’re going to stand their ground. A guard rushes Keyar, and misses. Keyar backs off to shoot (attack of opportunity misses), and shoots him twice for 22 HP, finishing off everyone upstairs. 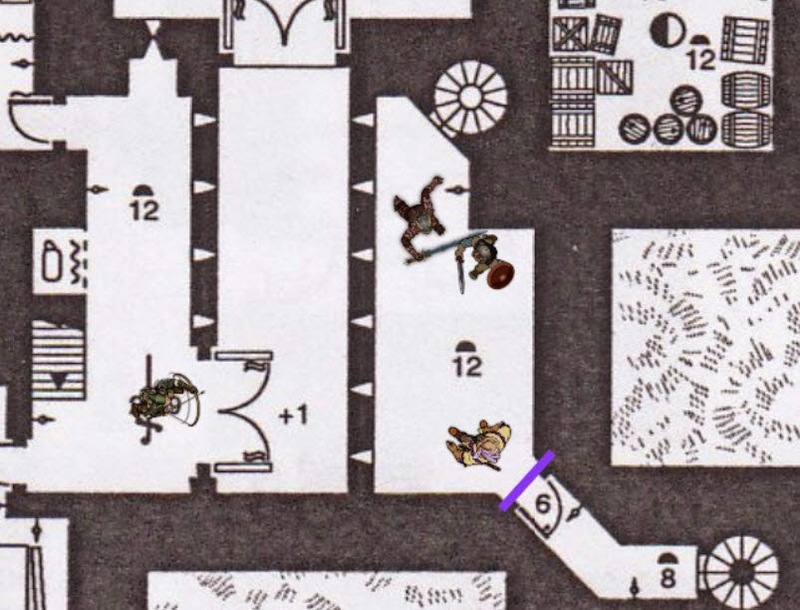 Vognur heads down the spiral stairs, and attacks with the new longsword pillaged from the Sheriff. He hits for 18 slashing damage, and the injured guard goes down. The final guard begs for his life. That leaves Leshar the Lizard Man, who grants him mercy this day, and the stale stench of urine hits Leshar’s nose. That’s the combat, for now. Keyar closes and bars the double doors, while Vognur ties up the surviving guards. Keyar enters a room, and gets surprised and stabbed by a bunch of guards laying in wait. He gets tagged for 3 HP. Keyar backs out (provoking attacks of opportunity, which miss), and he marks and shoots both, killing one. They slam the door shut, and bolt or block the door. Keyar picks up a dead body from the floor and uses him as a battering ram (+1 damage!) to slam into the door. A roll of 13 (net) is sufficient to open the door! Vognur and Leshar hear the fighting through the arrowslits. They run upstairs through the hall, passing Mark’s unconscious body. Keyar’s turn, and he once again takes a step back, provoking a failed attack of opportunity, but misses both times. One of the guards hits Keyar, for 9 HP. Keyar pulls his rapier, misses twice, and he’s struck in turn for 5 HP. Vognur arrives, and quickly dispatches the two guards. We’re out of combat again, so we decide that we’re about done for the night. Keyar applies Cure Light Wounds to Mark B. We note that the guys outside were carrying Knight-Killer crossbows. We’re in a world of hurt. We expend most of our healing magic. Three Cure Light Wounds and all of Mark’s 20 HP of Lay on Hands later . . . and we’re still in a world of hurt. Good news is that Mark sneaks over the border to Level 5. This will net him +3 instead of +2 for proficiency, an Extra Attack, an extra 1st level and two second level spell slots. I also realize that I’ve been doing my Paladin spells wrong – but no worries, easily fixed if I live to get another Long Rest. +Rob Conley +Tim Shorts +Joshua Macy +Daniel McEntee +Chris C.
A great write-up as always. 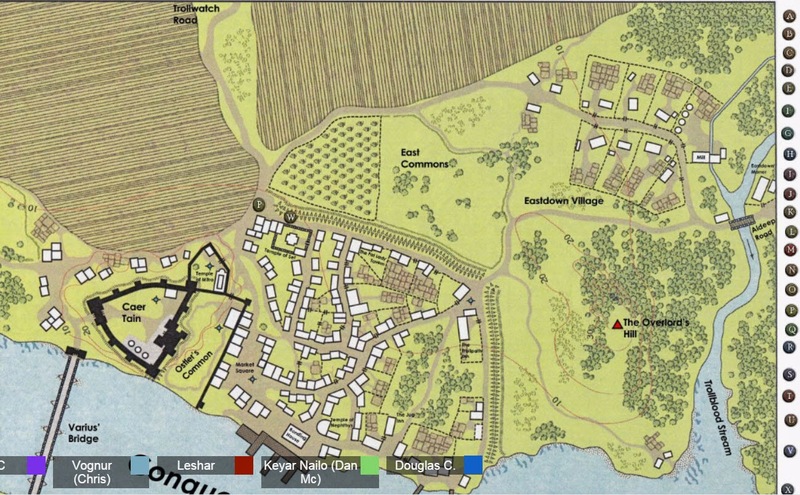 He said he was using player-created resources, but where did you find that map of Caer Tain? I can’t find it on Lythia.com – is there another good resource?